Mechanisms for induction of LYVE-1 HA interaction  a role for glycan re-modelling ? David Jackson is a biochemist who has studied a number of different cell surface proteins and membrane receptors over a period of some twenty years. He obtained a B.A. (Mod.) in Natural Sciences (Biochemistry) from Trinity College Dublin, in 1978, followed by a Ph.D. in 1983 with Dr. H. Paul Voorheis at the Department of Biochemistry. His doctoral research focussed on the variant surface glycoprotein (VSG) of Trypanosoma brucei  the parasite responsible for African sleeping sickness, and led to the discovery of the cleavable glycosylphosphatidylinositol membrane anchor. From 1983 to 1987, he carried out research that identified a number of other parasite surface antigens before moving to the University of Oxford, Nuffield Department of Medicine, to work with Profesor John I. Bell, exploiting new strategies to expression clone cDNAs encoding key human leukocyte surface receptors. It was in Oxford that David deveoped his interest in cell matrix adhesion receptors, and in particular, the hyaluronan receptor CD44. Through a Yamanouchi Research Fellowship in Cell Biology at Wolfson College Oxford (1992-1995), followed by an MRC Senior Fellowship (1995-2000), his work identified alternative splicing as a mechanism for the generation of heparan-sulphated forms of CD44 that bind growth factors, and to the discovery of a novel hyaluronan receptor LYVE-1, expressed on the surface of lymphatic endothelium. Just recently, Dr. Jacksons group (in collaboration with Dr Tony Day and Dr Martin Noble at the Department of Biochemistry in Oxford) successfully elucidated the structure of the CD44 hyaluronan-binding domain by X-ray crystallography and NMR spectroscopy, and efforts are now underway in his laboratory to isolate CD44:HA complexes for further X-ray crystallographic analysis. Dr Jackson is currently a group leader at the MRC Human Immunology Unit at the Weatherall Institute of Molecular Medicine in Oxford, and is continuing to research the function and structure of LYVE-1 and other Link superfamily hyaluronan receptors in the lymphatic system, as well as the mechanisms that regulate their interations with ligand. Until recently, our detailed knowledge of hyaluronan receptors and their biological significance has been mostly restricted to molecules such as CD44  a member of the Link superfamily that promotes the adhesion and migration of leukocytes and tumour cells. With the advent of the human genome mapping project and expansion of the DNA databases this situation has changed, and several novel hyaluronan receptors have now been identified. One such receptor, LYVE-1, the subject of this review, is confined to the endothelium of lymphatic vessels and sinuses  the main sites for hyaluronan degradation, and the compartments through which leukocytes and metastasizing tumour cells traffic to lymph nodes. Here I summarize the molecular characteristics of LYVE-1, its functional regulation, and its possible physiological role. In addition, I outline some significant similarities between the hyaluronan-binding domains of LYVE-1 and CD44 based on recent 3D structural analyses, and discuss preliminary evidence that they share some similarities in regulatory mechanisms. I conclude the review by summarizing the contribution that LYVE-1 has made as a molecular marker in pioneering studies into the biology of the lymphovasculature. Hyaluronan is an abundant glycosaminoglycan that is found within the extracellular matrix of virtually all tissues. This versatile molecule fulfills many different functions, but is primarily involved in cell adhesion and in the support of cell migration. Unlike other glycosaminoglycans, hyaluronan is not covalently attached to a polypeptide core but exists as an independent non-branched polysaccharide that associates non-covalently with large proteoglycans of the Link protein superfamily such as aggrecan, versican and link protein in the extracellular matrix. These large HA-protein complexes are in turn anchored to the surface of chondrocytes, fibroblasts and epithelial cells and fibroblasts via multiple low-affinity interactions with integral membrane receptors of the Link superfamily (see below) to stabilize connective tissues such as bone and cartilage and the dermis/epidermis in skin 1,2. The degradation products of hyaluronan - oligosaccharides of 100 kDa or less - can also bind to cells. However these interactions trigger cell "activation", leading to the production of inflammatory cytokines and chemokines, 3 vasoactive agents such as nitric oxide, or angiogenesis 4,5. Thus the biological properties of intact and degraded hyaluronan are different, and hyaluronan degradation appears to have been compartmentalized in order to avoid inappropriate exposure of cells and tissues to the "danger" signals given by hyaluronan fragments. Metabolic studies monitoring the fate of injected, tracer radiolabelled hyaluronan in mice, have shown that hyaluronan turns over with a half-life of approximately 24 h 6,7. Such a turnover rate is relatively rapid for an extracellular matrix molecule, the majority of which (e.g., collagen) have half-lives of several weeks or longer. Although the first stages of hyaluronan turnover occur locally in tissues, via free radical attack or matrix proteolysis (and limited uptake by CD44 positive macrophages in inflamed tissues), bulk degradation occurs only after the liberated hyaluronan enters the afferent lymph and is transported to local lymph nodes (Fig. 1). Here, the intermediate sized hyaluronan molecules are degraded to smaller fragments by a process whose details are only poorly understood; either the HA is scavenged by sinusoidal endothelial cells (possibly via the "professional" glycosaminoglycan receptor HARE 8,9) and degraded by lysosomal hyaluronidases, or it is hydrolyzed within the lumen of the sinus by soluble enzyme. The resulting small hyaluronan fragments, which leave the node in efferent lymph, eventually enter the blood circulation where they are taken up for terminal hydrolysis in liver, by endothelial cells that make up the sinusoidal lining, most likely via the same HARE receptor 9,10. Ordinarily, the levels of hyaluronan and its degradation products are maintained at very low levels in blood and peripheral tissues and only rise in response to injury, infection, neoplasia, or lymphedema, where there is disruption of lymph flow and/or alteration in the rate of hyaluronan catabolism 11. The lymphatics therefore play a vital role in hyaluronan homeostasis (summarized in Fig. 1). Fig. 1　The central role of the lymphatics in hyaluronan degradation. High molecular-weight hyaluronan (> 106 Da) complexed with proteoglycans in tissues, such as skin, is partly degraded to yield products of 105-106 Da which enter the afferent lymphatics for further degradation in the lymph nodes. The low molecular weight fragments are carried via efferent lymph to the portal blood and are terminally degraded in liver (90%), and to a lesser extent in spleen (1%) and kidney (9%). Aside from considerations of metabolic turnover, the circulation of hyaluronan in the lymphatics is interesting in view of the role of this glycosaminoglycan as an adhesive substratum for leukocyte transendothelial trafficking 12. Within the blood vasculature for example, the presence of the hyaluronan receptor CD44 on the surface of both leukocytes and endothelial cells facilitates transmigration at sites of inflammation where the synthesis of hyaluronan is upregulated in response to local cytokine release 13,14,15. Curiously however, CD44 is absent in the lymphatic vasculature; rather, the major hyaluronan receptor is a distinct, but related molecule, LYVE-1 (Lymph Vessel Endothelial HA receptor 1) 16,17. LYVE-1, like most HA-binding proteins, is a member of the Link protein superfamily, all of whom contain a consensus hyaluronan -binding domain termed the "Link" module, whose 3D structure resembles the C-type lectin fold 18,19 [ see article by Day, A.J. this series]. LYVE-1 was identified by homology searches of the combined Human Genome Sciences / TIGR EST databases with the amino acid sequence of full-length CD44H. LYVE-1 comprises a 322-residue integral membrane glycoprotein with a single N-terminal Link module 16,17,20 at the end of a membrane-proximal domain that is predicted to be heavily O-glycosylated 16 (Fig. 2). The extent of O-glycosylation is considerable, and is largely responsible for the anomalous migration of the receptor during SDS-PAGE, which indicates an apparent molecular mass (60-70 kDa), some 20 kDa larger than that calculated from the primary sequence. An unusual feature of LYVE-1 is the presence of an unpaired cysteine residue (Cys 201 in Fig 3) towards the C-terminal end of the extracellular domain, which forms an intermolecular disulphide linkage (Nightingale, T. & Jackson, D.G. unpublished). The physiological significance of covalent LYVE-1 dimers is not yet clear. In common with CD44, its closest homologue, LYVE-1 is anchored to the membrane by a 20 residue hydrophobic domain containing a cysteine residue and terminates with a 70 residue cytoplasmic tail (Fig. 3). Indeed, the main difference between LYVE-1 and CD44 is the presence of a shorter membrane-proximal domain in LYVE-1, and the presence of two rather than five N-glycosylation sites within the Link module, both of which carry sialylated sugar chains (Fig. 3). In terms of amino acid sequence however, LYVE-1 is only 43% similar to CD44, and the sole region of significant homology is the HA-binding Link module 16. This can be interpreted as evidence that the two receptors may have diverged during evolution following an earlier gene duplication event. Fig. 2　Main features of the LYVE-1 molecule. The LYVE-1 molecule is shown in cartoon form, with the N-terminal HA-binding domain at the end of a highly glycosylated "stalk" region; N-linked glycans are shown in green and O-linked glycans in red. The "consensus" Link module present in all Link superfamily members and the regions to the N- and C-terminus believed to form a regulatory Link extension analogous to that in CD44 are shaded blue and yellow respectively (see also Fig. 3). A group of basic residues similar in relative location to the group of basic residues that contribute to HA-binding in CD44 is depicted with red + symbols. Cysteine residues forming the three disulphide bridges (C1-C6, C2-C5 and C3-C4) in addition to single unpaired cysteine residues in the stalk region and the transmembrane domain are coloured yellow. Fig. 3　Alignment of LYVE-1 and CD44 amino acid sequences. Shown is an alignment of the human LYVE-1 and CD44 amino acid sequences. The predicted HA-binding domains encompassing the consensus Link module and its N- and C-terminal extensions are shaded blue and yellow respectively to conform with the shading in Figure 2. Cysteine residues forming disulphide bridges in the consensus Link domain (C2-C5) are shown in red and those in the Link extension (C1 and C6), the transmembrane domain and an additional unpaired cysteine unique to LYVE-1 are coloured orange. The two N-glycosylation sites (N53 and N130) are marked in green text and underlined. The tract of basic amino acids within the C-terminal Link extension of CD44 that is implicated in HA-binding (ref 36) is shown in violet, as is a similar tract further downstream of this region in LYVE-1. The transmembrane domains are shaded green. Confirming the functionality of its Link domain, LYVE-1 expressed either in full-length form on the surface of transfected COS or 293T cells, or as a soluble dimeric Fc fusion protein, binds both soluble and immobilized high molecular weight hyaluronan 16 (Fig. 4). Indeed, LYVE-1 appears to be a highly specific receptor for hyaluronan as assessed by competitive binding studies with other glycosaminoglycans including heparan sulphate and chondroitin sulphate, both of which fail to block binding even at concentrations in the millimolar range 16,17. Whether this means that LYVE-1 is more specific for hyaluronan than CD44, which has been reported to bind chondroitin sulphate, is uncertain given the likelihood that many preparations of such glycosaminoglycans are significantly contaminated with hyaluronan. The absolute binding affinity of LYVE-1 for hyaluronan has yet to be determined, but is an issue of considerable relevance to the possible physiological function of LYVE-1 (discussed further below). In the case of CD44, it has been estimated 21 (Day A.J. personal communication) that the affinity for hyaluronan is rather low (Kd > 100 µM), consistent with its role in hyaluronan -mediated cell migration, where multiple weak contacts with ligand analogous to those between selectins and their carbohydrate ligands  are continuously formed and broken. Based on comparison of the hyaluronan -binding curves for LYVE-1 and CD44 Fc dimers, the affinities of the two receptors may be quite similar 16. However, reliable estimates of LYVE-1 hyaluronan- binding affinity will require measurements with monomeric LYVE-1 preparations. Fig. 4　HA-binding characteristics of recombinant LYVE-1. Soluble LYVE-1 extracellular domain expressed as an IgG1 Fc fusion protein (left panel) binds immobilized hyaluronan, whereas soluble fusion proteins of the leukocyte surface antigens ICAM-2 and CD33 (ICAM-2 Fc and CD33 Fc), used as negative controls, fail to bind HA as assessed by a plate-binding assay (middle panel). In addition, human 293T fibroblasts transfected with full-length LYVE-1 bind fluoresceinated HA on the cell surface, whereas untransfected 293T fibroblasts do not (right panel). "Reproduced from The Journal of Cell Biology, 1999, vol 144, pp 789-801, by copyright permission of The Rockefeller University Press." By far the most striking feature of LYVE-1 is its pattern of tissue expression. From the very first analyses of tissue distribution using Northern blotting and RT-PCR, it became clear that LYVE-1 has an unusual expression pattern insofar as transcripts were virtually undetectable in haematopoietic cells, fibroblasts or epithelial cells 16. This is in marked contrast to CD44, which is the major hyaluronan receptor in these lineages. Furthermore, unlike CD44, which occurs in multiple different sized isoforms, LYVE-1 appears to be expressed as a single species and is not subject to alternative splicing of its coding exons. The major revelation came when LYVE-1 specific antibodies were used for immunohistochemistry. These studies showed consistently strong staining of vascular structures in skin, intestine and secondary lymphoid tissue  specifically vessels with thin endothelial lining which enclosed lumina that were often empty but always devoid of red blood cells (Fig. 5). The identity of these vessels as lymphatics as opposed to blood vessels was confirmed by double staining, which revealed mutual exclusion of haemovascular markers such as CD34, von Willebrand factor and CD44, and by co-expression of lymphatic endothelial molecules such as VEGFR3 (a receptor tyrosine kinase that transduces mitogenic signals from the lymphangiogenic growth factor VEGF-C) and the integral membrane mucoprotein podoplanin 16,17,22. Subsequent studies have further confirmed that most LYVE-1 positive vessels express PROX-1, a transcription factor that specifies lymphatic endothelial differentiation during early embryogenesis 23,24. LYVE-1 is now recognized as one of the most specific markers of lymphatic endothelium 25 and one which is invaluable for distinguishing between lymphatic vessels and blood vessels in studies of lymphangiogenesis and lymphatic function in normal and neoplastic tissues (discussed below). Fig. 5　Immunohistochemical detection of LYVE-1 in lymphatic vessel endothelium. Staining for LYVE-1 in small lymphatic vessels of human colon (panels a and b), in salivary gland (panel c) and in cortical/medullary sinuses of lymph node (panel d) detected using an enhanced immunoperoxidase technique. The arrows in a and b point to lymphatic vessels filled with nucleated (Giemsa stained) leukocytes. In panel c, an empty LYVE-1 positive lymphatic (black arrow) is seen adjacent to an erythrocyte-filled LYVE-1 negative blood vessel (red arrow). Arrows in panel d point to LYVE-1 positive lymph node cortical sinuses, some of which contain leukocytes. 4. LYVE-1 and its likely physiological functions. The finding that LYVE-1 is mostly confined to the lymphatics, where its expression appears to be mutually exclusive with that of CD44 is intriguing. Clearly, the properties of LYVE-1 must be tailored to its particular function in lymphatic endothelium  but what is that function ? One possibility is that LYVE-1 acts as an HA transporter. For example, transcytosis might convey hyaluronan from surrounding tissues to the lumen of afferent lymph vessels, or across the sinusoidal endothelium of lymph node, liver or spleen, for subsequent internalization by fibroblasts or macrophage-like cells. In support of such a role, LYVE-1 is expressed on both the lumenal and basolateral faces of lymph vessel endothelium, as shown by transmission EM studies with immunogold-labelled antibodies 17,26. The counter argument to this hypothesis is that lymph vessels, unlike blood vessels, are relatively permeable to dissolved macromolecules. One of the main functions of the lymphatics is to collect tissue fluids, and many of the junctions between smaller endothelial cells in lymphatic capillaries form loose overlaps to facilitate this property, as opposed to the tight junctions formed between adjacent blood vessel endothelial cells. Furthermore, experiments to measure the permeability of lymphatic vessels to hyaluronan in intact tissues have shown little or no reflection by lymphatic endothelium 27. Hence there may be no requirement for a receptor to transport hyaluronan into lymphatic capillaries. LYVE-1 might alternatively be involved in the uptake of hyaluronan for its catabolism within endothelial cells themselves, eg. in afferent lymphatic capillaries, or in the sinuses of lymph nodes, liver or spleen  the major sites for hyaluronan degradation. In support of this hypothesis, we have shown that LYVE-1 can indeed internalize high molecular weight hyaluronan in transfected fibroblasts 17 (Fig. 6). Curiously, the pathway of internalization appears similar to that of CD44 28 insofar as it does not involve coated pits or caveolae (Prevo, R. and Jackson D.G. unpublished). The cytoplasmic tail of LYVE-1, like that of CD44, contains no conventional signals for internalisation, and we have even found that its total deletion has negligible effect on fluoresceinated hyaluronan uptake (Nightingale, T and Jackson, D.G. unpublished). However, it seems unlikely that LYVE-1 is responsible for bulk HA uptake in vivo, as the rate of internalization we observed in vitro is low compared to that reported for the conventional endocytic HA receptor HARE in isolated liver cells 29. Furthermore, the mechanism that transports hyaluronan across sinusoidal endothelium is known to be relatively unspecific for glycosaminoglycans, and readily blocked with chondroitin sulphate and heparin, quite unlike LYVE-1 9. A role for LYVE-1 in HA uptake by afferent lymphatic capillary endothelium cannot however be ruled out. Fig. 6　LYVE-1 transfected cells internalize fluoresceinated hyaluronan in vitro. LYVE-1 transfected human 293T cells bind and internalise fluoresceinated-HA (Fl-HA) from the surrounding medium as assessed in a time-course of uptake experiment by quantitative FACS analysis (left panel; MFI, mean fluorescence intensity) and by fluorescence microscopy (right panel Triangles represent the extent of uptake of HA by untransfected 293T cells. Another possibility is that LYVE-1 is primarily involved in cell adhesion, either in promoting the interaction of leukocytes with endothelium, or conversely in blocking it. One of the main functions of afferent lymph vessels is to act as conduits for antigen-presenting dendritic cells and activated lymphocytes, both of which are known to express CD44 in its active, HA-binding state. If HA was sequestered on the luminal surface of afferent vessels, this might impede the passage of leukocytes and lead to obstruction. In fact, the default HA-binding status of LYVE-1 on lymphatic endothelium appears to be "off". For example, immunohistochemical detection of hyaluronan in tissues using biotinylated HA-binding protein (a complex of the G1 domain of Aggrecan and the Link protein) has so far failed to reveal significant amounts of endothelial-associated hyaluronan or appreciable co-localization with LYVE-1. Similarly, perfusion of tissues with FITC-labelled hyaluronan has failed to show sequestration by lymph vessels, even after prior removal of endogenous glycosaminoglycan by hydrolysis with hyaluronidases. Even freshly isolated lymphatic endothelial cells expressing LYVE-1 fail to bind hyaluronan in culture as assessed by fluorescence microscopy and FACS analysis (Nightingale, T. and Jackson, D.G. unpublished). Perhaps in its functionally inactive state, LYVE-1 plays an anti-adhesive role similar to that proposed for other sialylated glycoproteins that carry mucin-like sugar chains such as leukosialin and endomucin. Perhaps LYVE-1 becomes pro-adhesive only after appropriate activation, as in the case of its closest homolog CD44 30. The activation of CD44 in leukocytes by inflammatory cytokines is an elegant example of how specific cell  extracellular matrix interactions can be modulated by environmental cues. Precisely how such activation is achieved is slowly becoming clear, and ongoing structural analysis of CD44, briefly summarized in this section, is shedding further light on the subject. One of the main mechanisms for activation appears to be the re-modelling of N-linked sugars at one or more of the five sites within the CD44 HA-binding domain  the region containing the Link module 31,32. In several cell types, the lack of HA-binding appears to correlate with CD44 sialylation 33. For example, in myeloid cells, HA-binding can be unmasked by enzymatic cleavage of sialylated N-glycan chains 33, by treatment with phorbol ester 34, or by exposure to conditions that induce endogenous sialidase activity 35. Moreover, disruption of two particular N-glycosylation sites (Asn25 and Asn120) can render HA-binding in some "inducible" cell lines constitutively "active" 32. Precisely how the re-modelling of N-linked sugar chains can unmask HA-binding to CD44 is now becoming clear as a result of recent structural analyses using X-ray crystallography and NMR spectroscopy 36. Like all Link superfamily members, the HA-binding domain of CD44 is centered on the so-called Link module - a protein unit of approximately100 amino acids, that contains 4 highly conserved cysteine residues separated by sequences of basic and hydrophobic amino acids. As defined by structural analysis of the TSG-6 molecule, this resembles a C-type lectin-like fold, made from two antiparallel β sheets and two short α helices, stabilized by two disulphide linkages and encapsulating a central hydrophobic core 18 (Fig.7). The exposed, partly hydrophobic HA-binding face is made up largely from lysine, arginine and tyrosine residues brought together from non-contiguous loop regions between the secondary structure elements. However, in CD44 the HA-binding domain is more complex and involves portions of the polypeptide chain extending beyond both the N- and C-terminal ends of the consensus Link module that are critical to the regulation of receptor function. The features that identify these extensions can be listed as follows. Firstly, the consensus Link domain in CD44 is bracketed by an additional pair of cysteine residues that form a third disulphide linkage whose integrity is essential for correct folding 40 and function of the HA-binding domain (See Fig 3). Secondly, as shown from site-directed mutagenesis studies, a group of four basic amino acids (Arg150, Arg154, Lys 158 and Arg162) some 20-30 residues C-terminal to the Link module contribute to HA-interactions 37,38, inferring that the consensus Link module forms only part of the HA-binding domain. Thirdly, epitope mapping of CD44 mAbs that induce HA-binding has revealed these to be formed from discontinuous portions to the N and C-termini of the consensus Link module 39, inferring that these peripheral regions come together in the overall structure to form the activated ligand-binding domain. Fig. 7　Structures of the consensus and extended Link modules. The figure compares cartoon representations and space-filling models of the consensus Link module from TSG-618,19 with those of the extended Link module from CD44, recently derived by X-ray crystallography and NMR spectroscopy of the HA-binding domain (residues 20-178) expressed in E. coli 36. The consensus Link module is composed of two β sheets S1 (yellow) and S2 (green) comprising β strands 1, 2 and 6, and β strands 3, 4 and 5 respectively, bracketed by a pair of short α helices (α1 and α2 in pink). The two conserved intramolecular disulphide linkages are shown in red. The HA-binding surface is made up from residues within the loops joining the secondary structural elements. 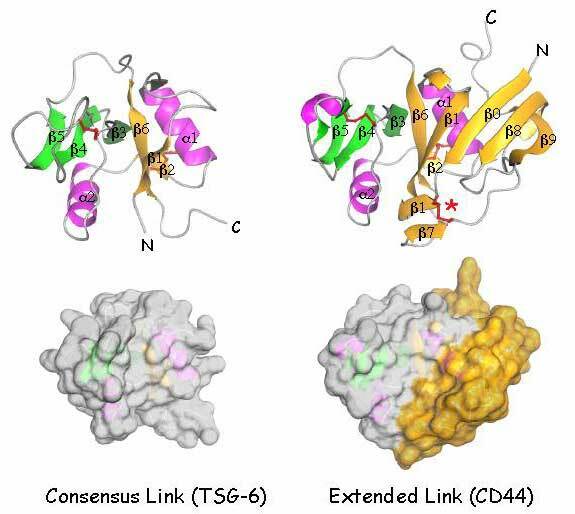 The Link module of CD44 carries an additional four β strands, β 0,β 7,β 8 and β 9 derived from the N-and C-terminal extensions which form an extra structural lobe, coloured yellow in the spacefilling model and stabilized by a third disulphide linkage (red asterisk). Some of the features of this extension, implicated in regulating HA-binding have counterparts in LYVE-1 (see text). The recently defined 3D structure of CD44 (Fig.7) shows that the extended HA-binding domain comprises two orthogonally disposed α helices and a total of ten β strands organized into a single long, curving, β sheet 36. Within this sheet, the six β strands of the consensus Link module (β 1-β 6) are supplemented by four additional β strands (denoted 0, 7, 8 and 9), coming from the N- and C-terminal extensions which form a distinct structural lobe (Fig 7 + 8), increasing the dimensions of the main HA-binding surface from one that can accommodate a hyaluronan hexasaccharide to one that could potentially accommodate an octasaccharide 36. The most notable feature of the extended CD44 Link module is that it places a key N-glycanation site (Asn25) close to the midpoint of the HA-binding surface, where its sugar chain (when appropriately modified) could conceivably block hyaluronan -interaction by steric hindrance (Fig.8). Fig. 8　Role of the extended Link module in regulating HA-binding. 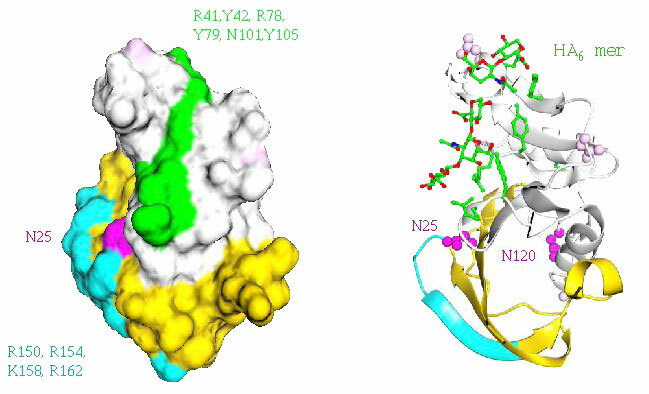 The role of the Link module extension, which forms an additional structural lobe (yellow and turquoise), is shown in the space-filling model of CD44 (left panel) as contributing additional potential contact residues (turquoise shading and text) to the main HA-binding face (green shading and text) to form an enlarged HA-binding surface that could accommodate an 8-mer saccharide unit. The cartoon structure (right panel) is shown in the same orientation, with an HA 6mer modelled onto the putative binding surface. Significantly, one of two key regulatory N-glycosylation sites (Asn25), shown in pink, lies at the junction of the consensus Link module and its lobular extension where its covalent sugar chain, if appropriately modified, could block HA-binding through steric hindrance36. Does LYVE-1 share these features and could its capacity to bind hyaluronan be regulated in similar fashion to CD44 ? The answer to both questions is a qualified yes. Firstly, the consensus Link module in LYVE-1, marked by the four conserved cysteine residues C61, 85, 106 and 128 (C2, C3, C4 and C5), like that of CD44, is bracketed by two additional cysteine residues C36 and C139 (C1 and C6, Figure 4) with an inter-residue spacing (C1 - X24 - C2 - X23- C3 - X20- C4 - X20  C5- X10 - C6) that is identical to CD44 and an overall sequence similarity of 57% 16,17 (See Fig. 3). Again, in common with CD44 40, the integrity of the additional cysteines (and the region immediately C-terminal to C139) is essential for folding of the LYVE-1 HA-binding domain, and glycosaminoglycan-binding as assessed by expression/re-folding studies in E.coli and the results of graded truncations of LYVE-1 ectodomain Fc fusion constructs (Banerji ,S. Nightingale, T. and Jackson, D.G. unpublished). Secondly, the LYVE-1 sequence contains a tract of basic residues (R195RKK198) downstream of the consensus Link module, that is similar (though not identical) to the one in the extended "lobe" of CD44 (R150DGTRYTKK158) which contributes to HA-binding (See Fig. 3). These observations indicate that the LYVE-1 hyaluronan-binding domain extends beyond the boundaries of the consensus Link module. 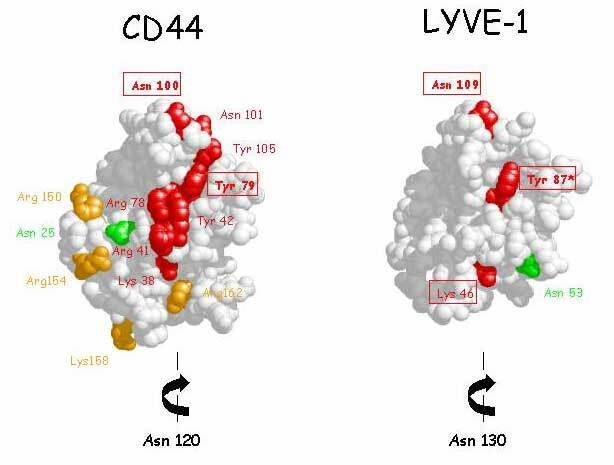 Thirdly, in a model of the LYVE-1 HA-binding domain derived from the CD44 crystal co-ordinates, three potential contact residues Lys46, Tyr87 and Asn109 can be seen to occupy similar positions to their counterparts in CD44. In addition, the two LYVE-1 N-glycosylation sites map to positions that are either identical (Asn130) or at least broadly similar (Asn53) to the ones believed to regulate HA-binding in CD44 (Fig 9). Although the precise identity and orientation of the HA-binding site in LYVE-1 has yet to be determined, it is tempting to speculate that appropriately modified sugar chains might regulate the function of the receptor through steric effects on either HA-binding or receptor self-association in a fashion analogous to CD4436. Efforts to express soluble glycosylated LYVE-1 constructs for structural analysis are currently underway to explore this fascinating possibility. Fig. 9　Potential regulatory N-glycosylation sites in the LYVE-1 HA-binding domain. A space-filling model of the LYVE-1 Link module, based on the CD44 structure 36 shows that the two LYVE-1 N-glycosylation sites (Asn53 and Asn130) are located in broadly similar positions on the molecule as are two of the N-glycosylation sites (Asn25 and Asn120) in the CD44 molecule that are implicated in regulating HA-binding32 (Note that Asn120 in CD44 and Asn130 in LYVE-1 are located at the rear of the HA-binding face in each case and are not shown in these models). Residues within the consensus Link module of CD44 that make up the putative HA-binding face (identified on the basis of site-directed mutagenesis37,38) are coloured red or orange, as are the three conserved residues (indicated by boxing) within the equivalent surface of LYVE-1. Note the identities of HA-binding residues in LYVE-1 have yet to be determined (Banerji and Jackson unpublished). Glycans attached to Asn53 and Asn130 if appropriately modified could conceivably regulate HA-binding through direct steric hindrance, or interference with receptor self-association respectively, as envisaged for CD44 (see also Fig 8). 6. Mechanisms for induction of LYVE-1 HA interaction  a role for glycan re-modelling ? Aside from structure-based arguments, there is also experimental evidence that LYVE-1 is functionally regulated in similar fashion to CD44. Preliminary work from our laboratory has shown that the extent of HA-binding is largely dependent upon cell-type, but can also be induced by cell activation. As outlined above, the receptor in transfected 293T cells and COS1 cells binds hyaluronan, whereas the endogenous receptor in primary lymphatic endothelial cells appears to be functionally "off". In addition, transfection of LYVE-1 into other cell types including cervical carcinoma and B-lymphoma cell lines indicates these also are non-permissive for HA-binding. Such features are similar to CD44, which is recognized to occur in an "on" or "off" state, based on data for the receptor in leukocyte and tumour cell lines (see ref. 31). We have found that "activation" of LYVE-1 transfected 293T cells with phorbol myristate acetate promotes a large (3-5 fold) increase in HA-binding. This parallels previously published findings with CD44 in certain "weakly binding" leukaemic cell lines which showed that HA-binding could be induced in vitro by treatment with phorbol ester or inflammatory cytokines  conditions that re-capitulate the "activation" of CD44 in circulating lymphocytes during inflammation in vivo. As discussed, the mechanism for inducing HA-binding in CD44 in many haematopoietic cell lines appears to involve the de-sialylation of N-glycans, some of which may directly impinge on the HA-binding domain. The PMA-induced binding of hyaluronan to LYVE-1 in 293T cells may well involve similar modifications. Summarizing the results of an extensive series of experiments (Nightingale T., and Jackson, D.G., manuscript in preparation), we have found that PMA-induced HA-binding in 293T cells involves de novo synthesis of a post-translationally-modified "active" form, coupled with shedding of existing receptor (Fig. 10). The likelihood that this modification constitutes N-glycan re-modelling is supported by the demonstration that induction by phorbol ester is blocked by treatment with tunicamycin, and by site-directed mutagenesis of the two N-glycosylation sites  under conditions where the native conformation of LYVE-1 appears to be maintained. The emerging picture is that the interaction between LYVE-1 and its ligand hyaluronan in lymphatics is tightly regulated and that the mechanisms may be broadly similar to those that regulate CD44-hyaluronan interactions in the blood vasculature. However, the picture is still hazy, and we do not yet know precisely how the glycosylation pattern of LYVE-1 differs between functionally silenced cells (i.e., lymphatic endothelial cells) and functionally active cells such as 293T cells. Ongoing experiments are currently addressing this question. 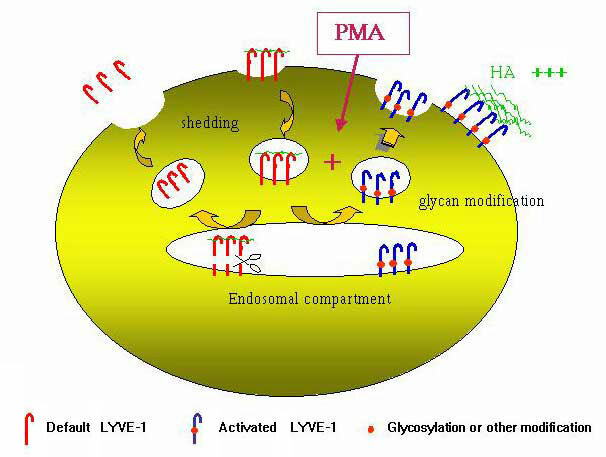 The cartoon shows the various steps thought to occur during PMA-activation of LYVE-1 to bind fluoresceinated-HA in transfected 293T cells. The foregoing sections have discussed current research into the structure and likely physiological function of LYVE-1. This is one aspect of LYVE-1; another is the application of the receptor as a molecular marker for the identification of lymphatic endothelium in studies of embryonic lymphangiogenesis 23 and for distinguishing between blood and lymphatic vessels in pathological tissue 41 (see Fig. 5). Knowledge of the fundamental biology of the lymphatics has lagged behind that of the blood vasculature, due largely to the lack of specific markers 25. However the identification of LYVE-1 (and other molecules such as VEGFR3 and podoplanin) has seen the dawning of a new era in lymphatic research. An area in which the application of LYVE-1 antibodies has been particularly significant is that of tumour lymphangiogenesis, and the role played by the process in the lymphatic spread of tumours. While many cancers including breast, prostate, colorectal and gastric types show early metastasis to lymph nodes, it has remained controversial whether this is achieved by the formation and invasion of new lymphatics (tumour lymphangiogenesis 25, 26,42-46) or by invasion of pre-existing lymphatics at the tumour periphery (see below for discussion). The issue is of significant clinical relevance, for if lymphangiogenesis in primary tumours proves predictive of lymph node metastasis, then its detection would be a valuable prognostic tool in cancers such as breast carcinoma, where tumours can be node-negative at resection but often relapse. Early identification and appropriate treatment of these high-risk patients could significantly improve survival. In addition, tumour lymphangiogenesis could be a legitimate target for therapy. In a number of recent experimental and clinical studies using LYVE-1, tumour lymphangiogenesis has been both observed and quantitated. In the first instance, artificial induction of lymphangiogenesis in experimental xenotransplanted human tumours was shown to promote lymph node metastasis in immunocompromised mice. For example, over-expression of VEGF-C in orthotopically transplanted MDA-435 or MCF-7 breast carcinoma 42,46 or of VEGF-D in 293EBNA fibrosarcoma 47 promoted proliferation of LYVE-1-positive lymph vessels and increased subsequent metastasis of tumour to lymph nodes. A link between lymphangiogenesis and nodal metastasis has thus been established in animal models. However, studies using LYVE-1 immunohistochemistry have also revealed lymphangiogenesis in naturally arising human cancers including squamous cell carcinoma of the head and neck 48  a cancer that frequently spreads to neck lymph nodes  and in primary malignant melanoma, which spreads rapidly through the lymphatics 49-51. Moreover, the number of proliferating lymph vessels appeared to correlate with lymph node metastasis and poor prognosis. Although lymphangiogenesis may not be obvious in all cancers (see reference 52), the prognostic evaluation of tumour tissue with markers such as LYVE-1 may well prove to be valuable for routine pathological testing. This exciting field is still in its early stages and many questions remain to be answered, including the source and identities of each of the factors that induce normal/tumour lymphangiogenesis and the elucidation of the mechanisms by which tumours invade lymphatics and home to lymph nodes. We envisage that the use of LYVE-1 for isolation and analysis of primary lymphatic endothelial cells will be instrumental in answering such important questions. This review has focussed on LYVE-1, its peculiar expression in lymphatic endothelium and in the endothelia of spleen and liver sinuses, and the enigma of its precise physiological function. In addition, I have outlined the similarities between LYVE-1 and CD44, based on recent structural analyses, which suggest these two receptors form a separate branch of the Link superfamily that has evolved the capacity to regulate HA-binding affinity in response to specific extracellular signals. It should be stressed that research into LYVE-1 is still in its infancy, and one of the major goals will be to determine how LYVE-1 / hyaluronan interactions are switched on and off in vivo, and whether these interactions regulate cellular trafficking in the lymphatics, or hyaluronan metabolism. Further research will also address whether LYVE-1 is a signalling molecule, whether the receptor is shed from the cell surface of lymphatic endothelium, and how expression of the gene is regulated. The recent construction of LYVE-1 gene knockout mice will greatly facilitate this work. This work has been generously supported by the Medical Research Council (MRC), the Association for International Cancer Research (AICR) and Cancer Research UK (CRUK). 1. Kaya G, Rodriguez I, Jorcano JL, Vassali P & Stamenkovic I. Selective suppression of CD44 in keratinocytes of mice bearing an antisense CD44 transgene driven by a tissue-specific promoter disrupts hyaluronate metabolism in the skin and impairs keratinocyte proliferation. Genes Dev. 11: 996-1007, 1997. 2. Kaya G, Augsburger E, Stamenkovic I & Saurat JH. Decrease in epidermal CD44 expression as a potential mechanism for abnormal hyaluronate accumulation in superficial dermis in lichen sclerosus et atrophicus. J Invest Dermatol 115: 1054-8., 2000. 3. McKee CM, Penno M, Cowman M, Burdick MD, Strieter RM, Bao C & Noble PW. Hyaluronan (HA) fragments induce chemokine gene expression in alveolar macrophages. J. Clin. Invest. 98: 2403-2413., 1996. 4. West DC, Hampson IN, Arnold F & Kumar S. Angiogenesis induced by degradation products of hyaluronic acid. Science 228: 1324-6, 1985. 5. West DC & Kumar S. Hyaluronan and angiogenesis. Ciba Found Symp 143: 187-201, 1989. 8. McGary CT, Raja RH & Weigel PH. Endocytosis of hyaluronic acid by rat liver endothelial cells. Evidence for receptor recycling. Biochem. J. 257: 875-884., 1989. 9. Weigel JA, Raymond RC, McGary CT, Singh A & Weigel PH. A blocking antibody to the hyaluronan (HA) receptor for endocytosis (HARE) inhibits HA clearance by perfused liver. J. Biol. Chem. 278: 9808-9812.,2003. 10. Zhou B, Weigel JA, Saxena A & Weigel PH. Molecular cloning and functional expression of the rat 175kDa hyaluronan receptor for endocytosis. Mol. Biol. Cell 13: 2853-2868., 2002. 11. Engstrom-Laurent A. Changes in hyaluronan concentration in tissues and body fluids in disease states. CIBA Foundation Symposia 143: 233-247., 1989. 12. Knudson CB & Knudson W. Hyaluronan-binding proteins in development, tissue homeostasis and disease. FASEB J. 7: 1233-1241., 1993. 13. De Grendele HC, Estess P & Siegelman MH. Requirement for CD44 in activated T cell extravasation into an inflammatory site. Science. 278: 672-675., 1997. 14. Mohamadzadeh M, DeGrendele H, Arizpe H, Estess P & Siegelman M. Proinflammatory stimuli regulate endothelial hyaluronan expression and CD44/HA-dependent primary adhesion. J. Clin. Invest. 101: 97-108, 1998. 15. Nandi A, Estess P & Siegelman MH. Hyaluronan anchoring and regulation on the surface of vascular endothelial cells is mediated through the functionally active form of CD44. J. Biol. Chem. 275: 14939-14948., 2000. 16. Banerji S, Ni J, Wang S-X, Clasper S, Su J, Tammi R, Jones M & Jackson DG. LYVE-1, a new homologue of the CD44 glycoprotein, is a lymph-specific receptor for hyaluronan. J. Cell Biol. 144: 789-801., 1999. 17. Prevo R, Banerji S, Ferguson D & Jackson DG. Mouse LYVE-1 is an endocytic receptor for hyaluronan in lymphatic endothelium. J. Biol. Chem. 276: 19420-19430., 2001. 18. Kohda D, Morton CJ, Parkar AA, Hatanaka H, Inagaki FM, Campbell ID & Day AJ. Solution structure of the link module : a hyaluronan binding domain involved in extracellular matrix stability and cell migration. Cell 86: 767-775., 1996. 19. Day AJ. Understanding hyaluronan-protein interactions. Glycoforum https://www.glycoforum.gr.jp/article/05A1.html. 20. Jackson DG. The lymphatics revisited: New perspectives from the hyaluronan receptor LYVE-1 . Trends Cardiovasc. Med.13: 1-7., 2003. 21. Skelton T, Zheng C, Nocks A & Stamenkovic I. Glycosylation provides both stimulatory and inhibitory effects on cell surface and soluble CD44 binding to hyaluronan. J. Cell Biol. 140: 431-446., 1998. 22. Jackson DG, Prevo R, Clasper S & Banerji S. LYVE-1, the lymphatics and tumor lymphangiogenesis. Trends in Immunology. 22: 317-321., 2001. 23. Wigle JT & Oliver G. Prox-1 function is required for the development of the murine lymphatic system. Cell 98: 769-778., 1999. 24. Wigle JT, Harvey N, Detmar M, Lagutina I, Grosveld G, Gunn MD, Jackson DG & Oliver G. An essential role for Prox1 in the induction of the lymphatic endothelial cell phenotype. EMBO J. 21: 1505-1513., 2002. 25. Jackson DG. New markers for the study of lymphangiogenesis. Anticancer Res. 7: 1-5, 2001. 26. Mandriota S, Jussila L, Jeltsch M, Compagni A, Baetens D, Prevo R, Banerji S, Huarte J, Montesano R, Jackson D, Orci L, Alitalo K, Christofori G & Pepper MS. Vascular endothelial growth factor-C-mediated lymphangiogenesis promotes tumour metastasis. EMBO. J. 20: 672-682., 2001. 27. Sabaratnam S & Levick JR. Reflection fraction for hyaluronan across lymphatic endothelium vs synovial interstitium. J. Vasc. Biol. (In Press): 2003. 28. Tammi R, Rilla K, Pienimaki JP, MacCallum DK, Hogg M, Luukkonen M, Hascall VC & Tammi M. Hyaluronan enters keratinocytes by a novel endocytic route for catabolism. J Biol Chem 276: 35111-22., 2001. 29. Zhou B, Weigel JA, Fauss L & Weigel PH. Identification of the hyaluronan receptor for endocytosis (HARE). J. Biol. Chem. 275: 37733-37741., 2000. 30. Lesley J, Howes N, Perschl A & Hyman R. Hyaluronan binding function of CD44 is transiently activated on T cells during an in vivo immune response. J. Exp. Med. 180: 383-387., 1994. 31. Lesley J, English N, Perschl A, Gregoroff J & Hyman R. Variant cell lines selected for alterations in the function of the hyaluronan receptor CD44 show differences in glycosylation. J. Exp. Med. 182: 431-437., 1995. 32. English NM, Lesley JF & Hyman R. Site-specific de-N-glycosylation of CD44 can activate hyaluronan binding, and CD44 activation states show distinct threshold densities for hyaluronan binding. Cancer Res 58: 3736-42, 1998. 33. Katoh S, Zheng Z, Oritani K, Shimozato T & Kincade P. Glycosylation of CD44 negatively regulates its recognition of hyaluronan. J. Exp. Med. 182: 419-429., 1996. 34. Liao H-X, Levesque MC, Patton K, Bergamo B, Jones D, Moody MA, Telen M & Haynes BF. Regulation of human CD44H and CD44E isoform binding to hyaluronan by phorbol myristate acetate and anti-CD44 monoclonal and polyclonal antibodies. J. Immunol. 151: 6490-6499., 1993. 35. Katoh S, Miyagi T, Taniguchi H, Matsubara Y, Kadota J, Tominaga A, Kincade PW, Matsukura S & Kohno S. An inducible sialidase regulates the hyaluronic acid binding ability of CD44-bearing human monocytes. J. Immunol. 162: 5058-5061, 1999. 36. Teriete P, Banerji S, Noble M, Blundell CD, Wright AJ, Pickford AR, Lowe E, Mahoney DJ, Tammi MI, Kahmann JD, Campbell ID, Day AJ & Jackson DG. Structure of the regulatory hyaluronan-binding domain in the inflammatory leukocyte homing receptor CD44. Mol. Cell 13: 483-496., 2004. 37. Peach RJ, Hollenbaugh D, Stamenkovic I & Aruffo A. Identification of hyaluronic acid binding sites in the extracellular domain of CD44. J. Cell Biol. 122: 257-264., 1993. 38. Bajorath J, Greenfield B, Munro SB, Day AJ & Aruffo A. Identification of CD44 residues important for hyaluronan binding and delineation of the binding site. J. Biol. Chem. 273: 338-343, 1998. 39. Liao H-X, Lee, D.M. Levesque, M.C. Haynes, B,F. N-terminal and central regions of the human CD44 extracellular domain participate in cell surface hyaluronan binding. J. Immunol. 155: 3938-3945, 1995. 40. Banerji S, Day AJ, Kahmann JD & Jackson DG. Characterization of a functional hyaluronan-binding domain from the human CD44 molecule expressed in Escherichia coli. Protein Exp. Purification. 14: 371-381, 1998. 41. Cursiefen C, Schlotzer-Schrehardt U, Kuchle M, Sorokin L, Breiteneder-Geleff S, Alitalo K & Jackson DG. Lymphatic vessels in vascularized human corneas: Immunohistochemical evidence using LYVE-1 and podoplanin. Invest. Ophthalmol Vis Sci. 43: 2127-2135., 2002. 42. Skobe M, Hawighorst T, Jackson DG, Janes L, Velasco P, Riccardi L, Claffey K & Detmar M. Induction of tumor lymphangiogenesis by vascular endothelial growth factor-C promotes breast cancer metastasis. Nature Med. 7: 192-198., 2001. 43. Pepper MS. Lymphangiogenesis and tumor metastasis: myth or reality ? Clin. Cancer Res. 7: 462-468., 2001. 44. Clarijs R, Ruiter DJ & de Waal RM. Lymphangiogenesis in malignant tumours: Does it occur ? J. Pathol. 193: 143-146., 2001. 45. Jain RK & Fenton BT. Intratumoral lymphatic vessels: a case of mistaken identity or malfunction ? J. Natl. Cancer Inst. 94: 417-421., 2002. 46. Mattila M-T, Ruohola JK, Karpanen T, Jackson DG, Selander KS, Alitalo K & Harkonen PL. VEGF-C induced lymphangiogenesis and lymph node metastasis in orthotopic MCF-7 tumors. Int. J. Cancer 98: 946-951., 2002. 47. Stacker SA, Caesar C, Baldwin ME, Thornton GE, Williams RA, Prevo R, Jackson DG, Nishikawa S, Kubo H & Achen MG. Vascular endothelial growth factor-D promotes tumour growth and spread via the lymphatics. Nature Med. 7: 186-191., 2001. 48. Beasley NJP, Prevo R, Banerji S, Leek R, Moore J, van Trappen P, Cox G, Harris AL & Jackson DG. Intrattumoral lymphangiogenesis and lymph node metastasis in head and neck cancer. Cancer Res. 62: 1315-1320., 2002. 49. Straume O, Jackson DG & Akslen LA. Independent prognostic impact of lymphatic vessel density and presence of low grade lymphangiogenesis in cutaneous melanoma. Clin. Cancer Res. 9: 150-155., 2003. 50. Dadras S, Paul T, Bertoncini J, Brown LF, Muzikansky A, Jackson DG, Ellwanger U, Garbe C, Mihm MC & Detmar M. Tumor lymphangiogenesis: a novelprognostic indicator for cutaneous melanoma metastasis and survival. Am. J. Pathol. 162: 1951-1960., 2003. 51. Oliver G & Detmar M. The rediscovery of the lymphatic system: old and new insights into the development and biological function of the lymphatic vasculature. Genes Dev. 16: 773-783., 2002. 52. Williams CSM, Leek RD, Robson AM, Banerji S, Prevo R, Harris AL & Jackson DG. Absence of intratumoral lymph vessels and lymphangiogenesis in human breast cancer. J. Pathol. 200: 195-206., 2003.